Tabitha is a so far unpublished novel in which a fourteen-year-old grows up to discover the world is more wonderful than she had believed as a child. This extract is from a chapter leading up to Christmas 2010. “You see why we pray for justice …” said Mr Thomas. Tabitha could see how important the Advent wreath with its prayers for justice, peace and love was to the Thomas’s, and why all the Christmas things mattered so much. She had become used to thinking of Christmas as being mostly about pretending things were OK, and secretly knowing (but not admitting) that, in fact, they weren’t. You covered it all up with cheesy Christmasy songs in which everyone was supposedly ‘having fun’, and getting the ‘Christmas feeling’ mostly through an alcoholic haze. It was supposed to be about families coming together, yet actually so many of them were broken – it seemed to her that more people seemed to fall out at Christmas than at any other time of the year. For Tabitha there was the business of going to see her estranged dad which meant leaving her mum on her own to drink to her loneliness. Tabitha never wanted to go, and her mum was always in a foul mood smelling of alcohol and tobacco when she got back. So, for her, the Christmas carols did not often resonate with joy, despite their words. Last Christmas the neighbours at fifty-seven refused to have their family for Christmas because the year before their son-in-law had got drunk and had apparently said some nasty things, which had not been forgotten. And then the people over the road had had a row on Boxing Day when someone was locked out and told to “f*** off”, and a slanging match between the excluded man in the street and someone in an upstairs window when on for over half-an-hour before the police arrived and took him away. So Christmas for Tabitha had not been all that great – she used to look forward to being on her own again in the new year. But for the Thomas family, despite all the terrible things that had happened and were still happening in Sudan, they really believed that Jesus coming into the world made a difference. It was not just about family, it was about God and his love and heaven for ever. They really felt that God was with them still in 2010. “The world is a very dark place,” stated Mr Thomas, “but God has come into it and shines in the darkness.” That was what the candles were all about Tabitha discovered. She hadn’t thought of that before. When you lit a candle – for justice, love or peace – you were kind of connecting God with it – and he was bright and lovely and actually brought those things to life in the world. Well at least to the Thomas’s and the other people who believed in him. That’s cool, thought Tabitha. “What are you and your mum doing at Christmas?” asked Mama Sarah, breaking into Tabitha’s reverie. “Well I mustn’t leave my mum any more than I have so. So I can’t. But thanks, it would have been great.” How wonderful to be with these people who actually believed in Christmas – the whole religious bit. They were going to be really happy. But no way could she, or would she, leave her mum. She was all Cindy had. 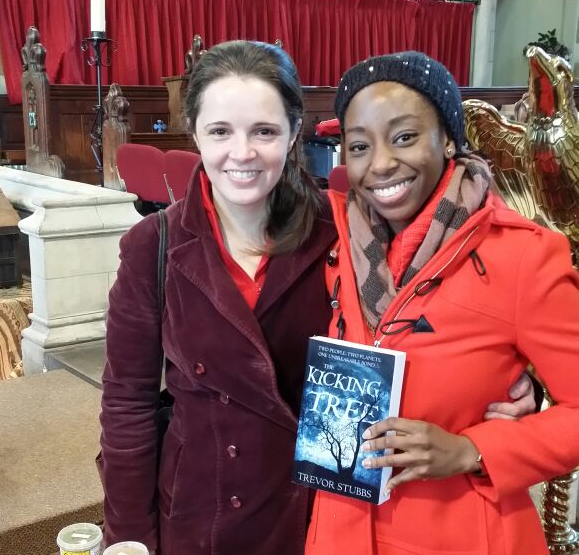 Two young friends meet up in London and pose for a picture with The Kicking Tree. Hope you enjoy it. The Kicking Tree is available online from http://www.whitegatesadventures.com or retailers. It’s now also available in public libraries in Bath and North East Somerset and maybe elsewhere. Let me know if you find it in yours.